in the Late Nineteenth Century. The clip clopping of donkey hooves have almost disappeared from Dyffryn Paith. Dyffryn Paith a small valley east of Aberystwyth, in the parish of Lower Llanbadarn y Creuddyn, Cardiganshire. The landowners of this area in the late nineteenth century were Powell's of Nanteos and the Parry's of Glanpaith. 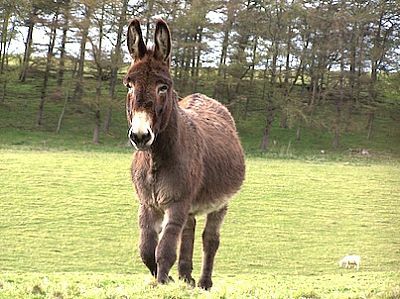 In the mid nineteenth century a donkey was an important animal of the farm. 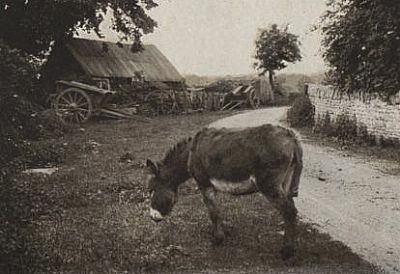 Most farmers in the area had a donkey, to use on their farms. The donkey was vital to help with carrying heavy loads that the farmer could not manage. The donkey is strong of character and infamously stubborn. But once trust and confidence is established between a person and donkey, it can make life a lot easier for the farmer. Donkeys were occasionally miss-treated, numerous cases of cruelty are shown in the local newspapers, together with reports to the RSPCA, thankful, none of the cases I found were located the Dyffryn Paith area. The donkey had to be well looked after to gain the fullness of their capabilities. 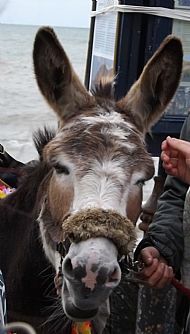 The hoof of a donkey is much softer than of a horse, and needs to be clipped regular. Having access to hard surfaces helps to keep the hooves trimmed; continuous wet ground is not suitable for their soft hooves. The shoeing of donkeys was necessary for their work, especially when travelling for some distances. 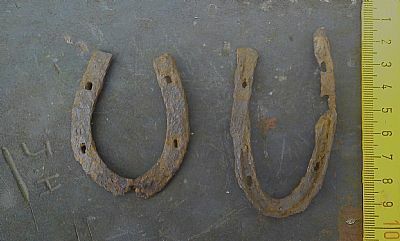 The front shoes were small and rounded, and the back shoes were a slightly longer. There was a fun side to owning a donkey in the Dyffryn Paith Valley; it was not all work, even in late nineteenth century. In March 1864, William Powell of Nanteos arranged with Matthew Vaughan Davies (Lord Ystwyth) of Tan-y-Bwlch, Aberystwyth a Steeplechase Event that was held on land at Tan-Castell (near Tan-Y-Bwlch), the field was fine firm ground and flat, perfect for racing. 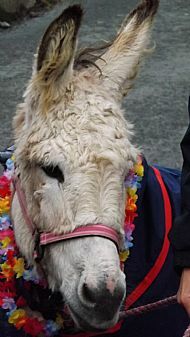 15 donkeys were involved in the Donkey Race, in this event. William Thomas Rowland Powell held these events on a regular basis. He ran the Nanteos Estate from 1854 – 1878, and with his Land Agent, organised regular events on the estate, for his tenants and workmen. These events were very popular in their time, and William Powell was a stickler for getting the estate workers and tenants together. William a keen huntsman and with a passion for sport, whether it was cricket on the Nanteos lawn, croquet, mock battles or a steeplechase. Much fun and jollity was had by these events, and in the evening with everyone in good spirit, beer drinking and dancing took place, deep into the night. 2, Thomas Edwards, Gors Issa Shop. 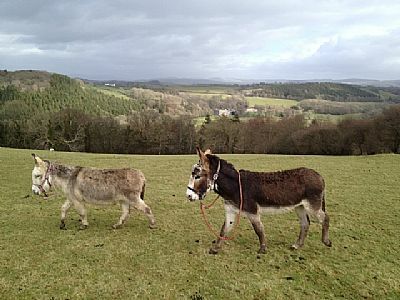 A different aspect of donkeys in the Dyffryn Paith Valley is of the travelling gypsy. They were often seen in Cardiganshire. Nanteos was a regular stop for the gypsies, (and probably the other large estates of the area). The travellers called Nanteos – ‘I Kaseki Filisin’; which means ‘The Hay Mansion’. They always expected a bundle of hay from the mansion. To respect the travellers, Nanteos would always oblige. 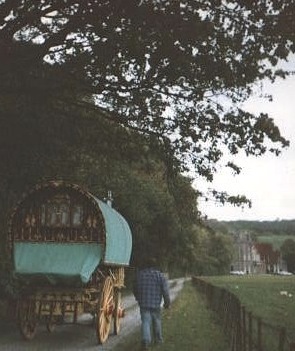 Gypsies were respected and their presence on farms, kept away vagrants who might cause problems with the landowners. The majority of the farmers were willing to permit them to stay on their land, for they helped with the work of the harvest and provided amusement in the evenings with their fiddles and harps. It was their custom always to stay on the same farms, year by year, on their travels. During their visits they made baskets from the willow and hazel trees and skewers from the elder, as well as strong pegs banded around the tops with strips of tin. In July in the year of 1909 the travellers called at Nanteos and sold a donkey for £0.3s.1d to the estate; where he lived on the estate in amongst the horses for many happy years. The gypsies used 'donkey caravans' these were small covered carts. The use of donkeys to pull their wagons began to dwindle due to their caravans getting larger and heavier, to which the horse took preference. A donkey would be hitched to the side of the van to carry packed up tents and to assist with extra pulling leverage, when required. By the end of the nineteenth century, the gypsies and their caravans are longer seen in the countryside with their horse drawn caravans. But the donkey was still prevalent, in the valley. 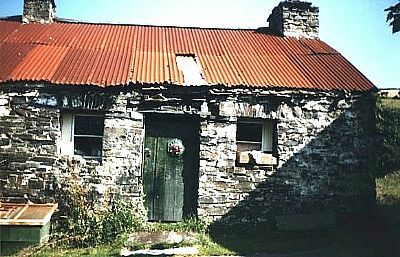 In Dyffryn Paith there were a group of shops (owned by Glanpaith), near to the junction that leads to Nanteos (where Panteg is located today). One of the shopkeepers, Mari 'Dragon' Evans grew her own produce to sell in her garden, located behind the shop. 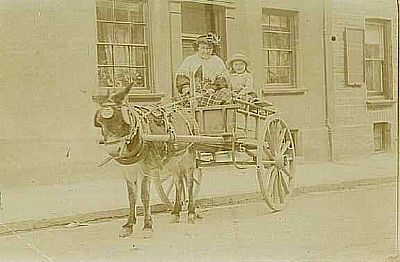 She would go into Aberystwyth once a week, with her donkey and cart to collect stock for her shop. She kept her customers supplied with essentials, for many years. She was still running the shop in 1911 aged 74. In the photograph below is Mari is photographed with her granddaughter Jane Ellen Evans with their trusted donkey and cart.